Products | Quincy Street, Inc.
At Quincy Street, we never lose sight of where our products will end up — on the tables of families like yours. Whether families are eating an Easter Ham or grilling our kielbasa, they are coming together over our food. We believe that nothing becomes a tradition like good food — and no one supports family traditions like Quincy Street. 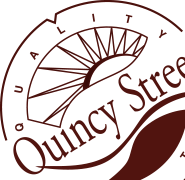 Quincy Street meats and meat products are made from the finest cuts of pork and other top-line ingredients. Our special cooking process uses the latest smokehouse technology and old-fashioned natural hickory smoking to deliver great taste, and great value.